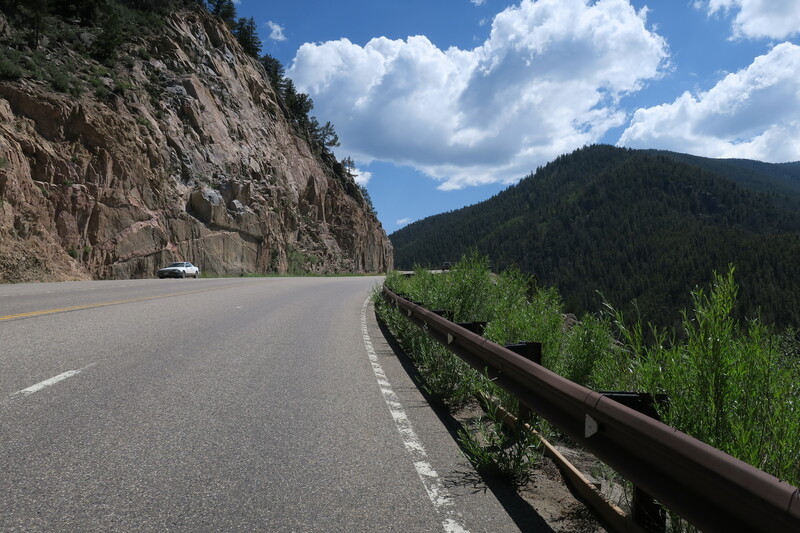 Our New Mexico – Colorado tour got back on the road Sunday with the first of three long days that took us across two of Colorado’s highest passes and another big ride to come tomorrow that crosses I-70 up to Kremmling. 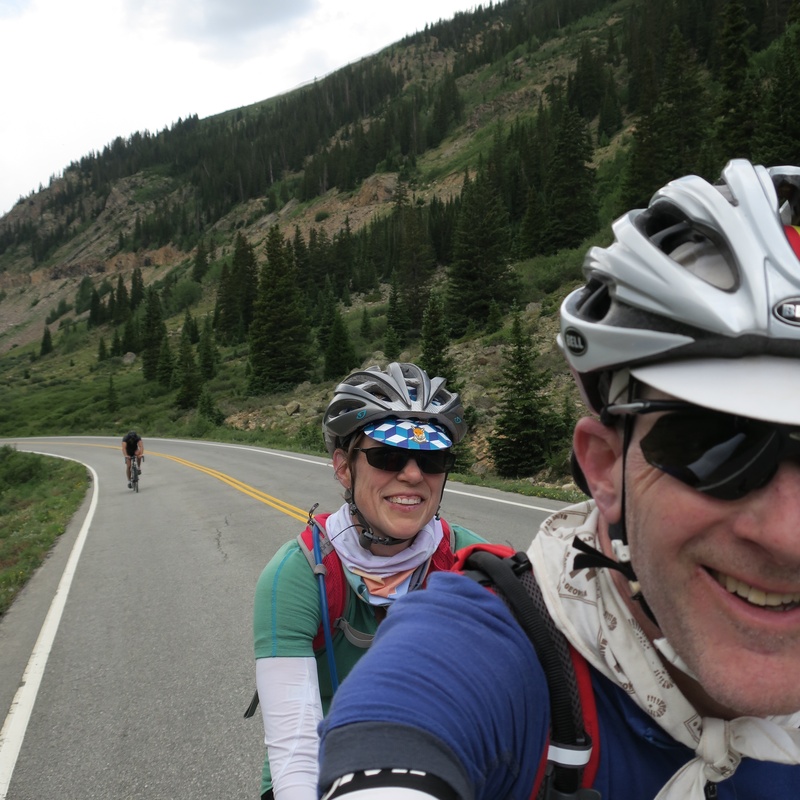 Sunday the route from Gunnison started well, with a gentle tailwind pushing us to Monarch Pass. But once on the ascent the traffic was very steady and noisy, with lots of trucks pulling campers, and in a couple cases we were harrassed. In another case I think a senior driver never saw us in front of her and I had to steer into the gravel as she blithely drove past. One of the threatening moves came from a driver of a cheapo Jeep who buzzed us and whose passenger flipped us off even though they had a clear passing lane to their left. We see more bad behavior from Jeep owners than other makes; I think they market to aggressive drivers. All this made it hard to enjoy the stunning views though we pulled over a couple of times for photos and to clear our heads. Colorado should really consider a bike lane on these long ascents if they continue to tout the state as a cycling destination. A Gunnison-based rider at the summit who we met chalked it up to drivers going home after the July 4 holiday and to construction to pave Cottonwood Pass east of Crested Butte. The descent to Salida for lunch was fast and uneventful though traffic was still strong and drivers seemed to be intent at all costs on passing any vehicle ahead. 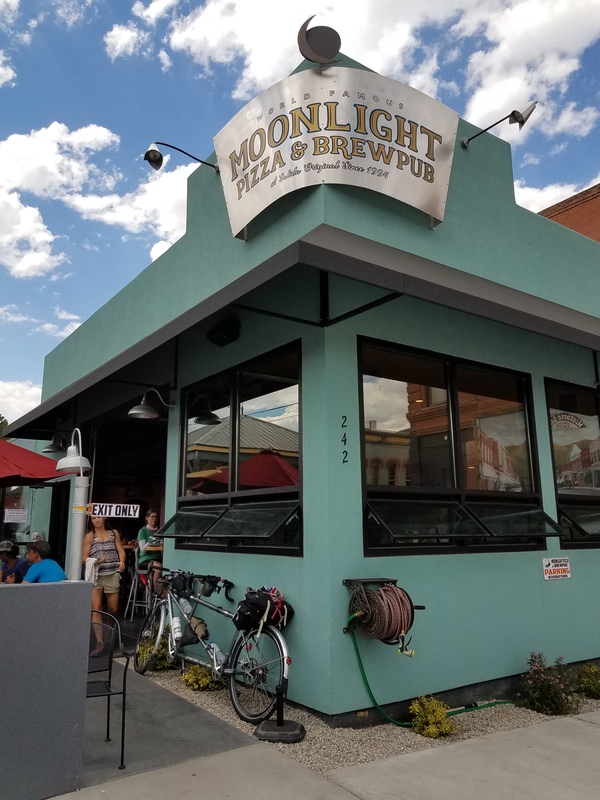 It was hot in Salida and we cooled our heels for awhile at Dawn Cafe, a funky coffee shop, and then went to pizza at brewpub Moonlight, which was fun. We got some praise for the tandem and our route from a couple of bikey folks and the food was quite good. Cafe Dawn. An oasis on a hot afternoon. US285 north to Buena Vista was one never ending stream of traffic, but the shoulder was wide except where an uphill passing lane was provided, which left us a teeny 3-foot shoulder. Colorado, more work needed here too. Buena Vista was a good stop for us. Our old pals at Boneshaker Cycles were closed but staff was still there and nicely sold me a tube of chamois creme. 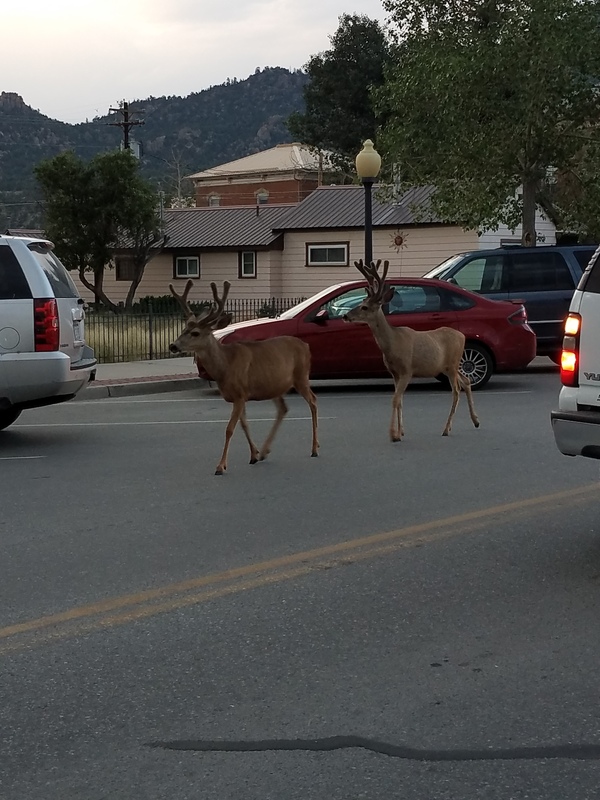 Deer paraded down Main Street as we had dinner at an outdoor eatery, real small town life. Today (Monday) US285 was much more quiet as we set out for Carbondale via Independence Pass and Aspen. 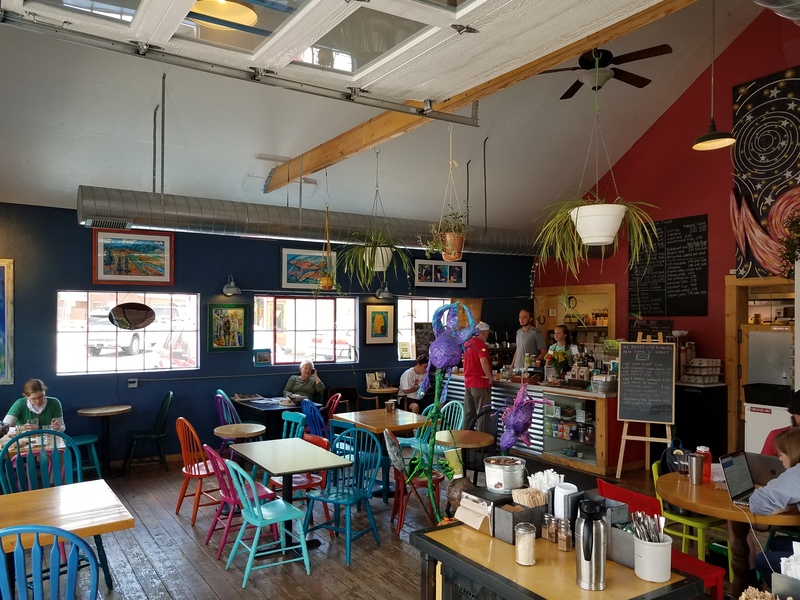 After a solid coffee start at Buena Vista Roastery Cafe, we got bananas at City Market, where I realized that I left my phone on a ledge outside the coffee shop. It was still sitting there when we returned, whew! The climb up Independence was steep at the bottom but had enough moderate sections to allow some recovery. There was little car traffic and we got some nice thumbs up here and there. 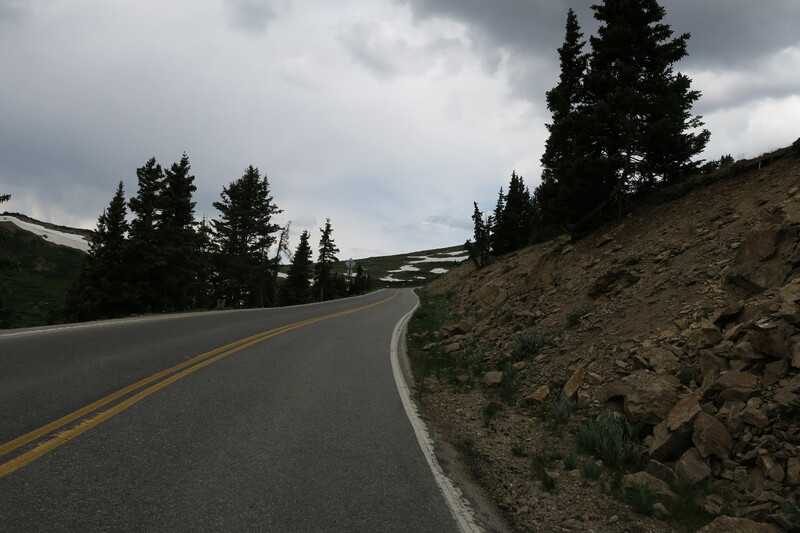 Still, topping 12,000 feet elevation is always a slow affair on a tandem and we were at it for more than two hours for the 12 miles that make up the main climb from the eastern side. Dark clouds gathered and it was drizzling at the summit. 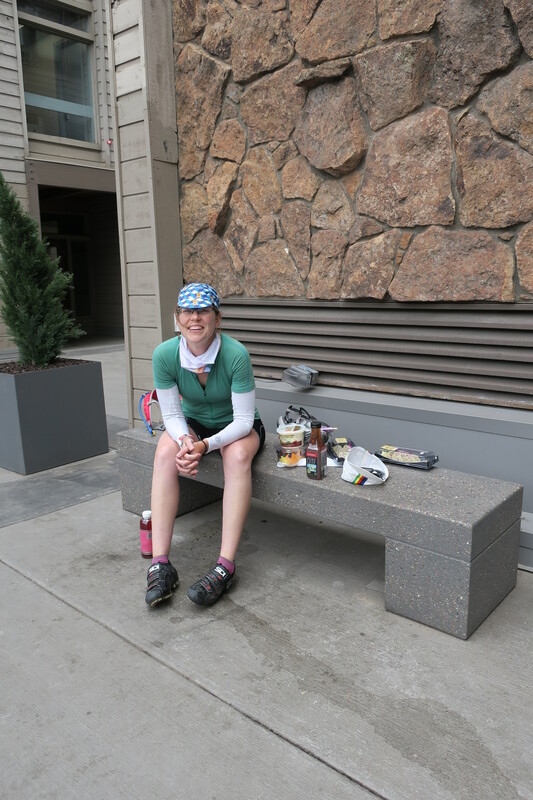 We got our photo taken and put on rain gear for the fairly technical descent to Aspen, with narrow switchbacks along the way. Another Jeep driver nearly caused a pileup trying to pass us around a blind turn when we were cruising at more than 40 m.p.h, but backed off when an oncoming car appeared and started blowing their horn. Aspen was busy but we made the best of it with lunch stuff from City Market that we ate in a nearby plaza. We also got me an espresso at Victoria’s (though not the $7 cake slice I really wanted) and we talked with a rider who had passed us on Independence and was there all cleaned up and in street clothes! He remembered us and I emailed him a photo of him easing past us on a steep part. The Rio Grande Trail, deserted on a Monday afternoon, got us to Carbondale 30 miles later around 6 p.m. We blew off dinner out and got pizza delivery to our abode tonight, the Comfort Inn. Tomorrow we ride a century to humble Kremmling. We have a few options to get us to State Bridge Landing and then up Trough Road, a gravel route into town for the night. We’ll check the fire reports but I think the one small fire near Eagle won’t affect us. It’s going to be hot but we’re used to that after nine riding days and will plan accordingly. 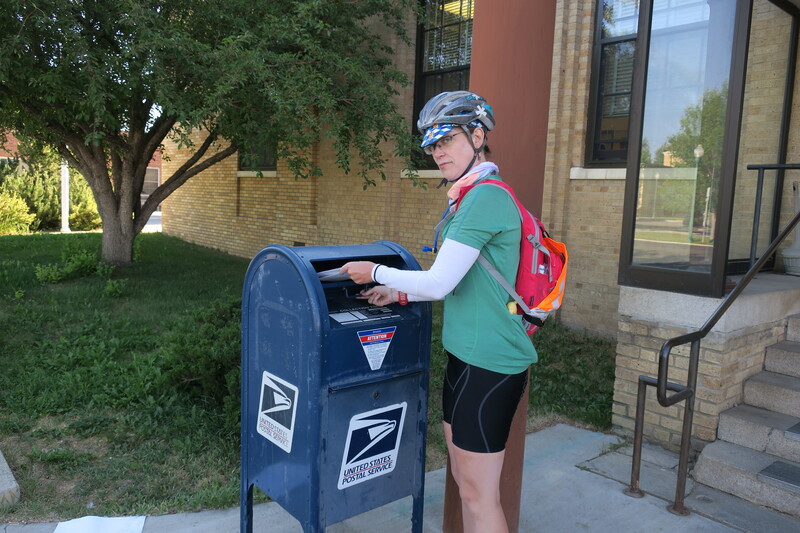 We will try to avoid Glenwood Springs if we can; that bike trail along I-70 is a bit narrow for a tandem, we found on our 2013 Colorado tour. Plus, Glenwood is a busy place.